Crystal readings and guidance for your zodiac sign for August! 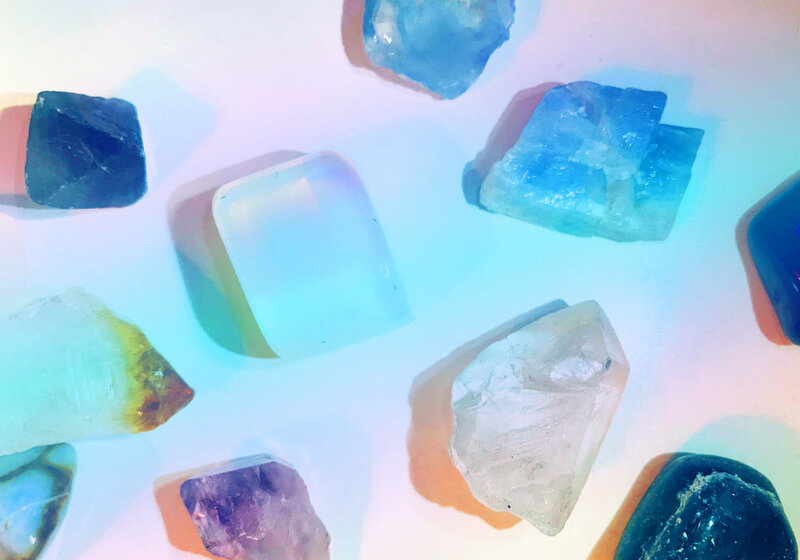 Crystaloscopes are an intuitive reading for each sign for the month ahead. Each comes with a little bit of “stardust self care”- this is a little way to take care of your inner cosmic AF self so you can shine as bright as you are meant to. Yup, the prozac stone is your August stone. The vibe this month is all about releasing fears or anxious thoughts around the unknown. You are on the verge of something you know it. No rush to “fix” things or know everything. You put so much pressure on yourself to do the right thing that sometimes it can end up leaving you paralyzed. When you are so bound to being perfect, you start to lose your freedom of motion which can stifle creativity and precipitate a state of exhaustion and stress that is extremely unhealthy. Though it may seem paradoxical, often giving ourselves a rest or permission to do nothing can actually lead us to be more productive, or at the very least more engaged and energized. Gift yourself 3 deep belly breaths every day this month. The truth telling stone comes to you this month to ask you to invite in self- acceptance, self-worth and honesty into your self-talk this month. Sodalite comes to also lift the fog of your brain and usher in clear thinking to remind you to trust your judgement and be gentle on yourself. Call on that knowledge when you need some extra strength or when you feel your sense of self being challenged. You’ve been through this before and you know how powerful your voice is- you may have just gotten temporarily distracted but the good news is now that you’ve stopped to think about it you realize you know yourself better than ever. To tend to your stardust this month, speak your mind- tell that coworker, partner, friend or sibling how you really feel and notice the weight that is lifted. inner growth, emotional balance and self love. Mercury, your ruling planet, is in Retrograde. So you might be feeling stuck and wanting to get hard on yourself but the more you slow down and tune in the more you can begin to learn to really trust yourself and your communications this month. You’ve been going non-stop, taking care of (and starting) business, fighting battles on the social justice front that need to be fought. But there comes a point where you need to give yourself a break and enjoy some stillness. Make room for what wants to come next. Creating stillness and space will actually help you get super clear on your communications and your plans for when Mercury goes direct. When was the last time you slept in or read a magazine just ‘cause? Honor your big picture visions this month but go easy on yourself in terms of timing and productivity. This is a big learning time- notice, we didn’t say MOVING time. August is a time for flow not force so enjoy a few lie-in mornings during this part of Leo season. Stone of the “now” moment. Hello dear moonchild! This month is all about staying PRESENT. Not dipping into the foggy memories of the past or the heated worried imaginations of the future. This month you are tasked with trying to stay in the here and now and saying no to a lot of requests from others. It might feel in the moment like you are neglecting others’ needs or shirking responsibility, but you will actually be doing everyone a favor in the long run. Let your children or your coworkers or boss or dog or whoever it is you feel obligated to, let them see what radical self love and boundaries look like. Yes you are on a journey of emotional deep diving and healing. But for now, at least during these last full weeks of summer, let yourself off the spiritual hook and just be for a little while. You don’t need to read all the latest articles about self-development and you can lighten up on your goal to maintain a disciplined daily meditation practice. This is part of your own healing, but it will help them heal and grow too. Go to a movie in the theater and revel in the air-conditioned calm. This stone is all about activating the energies of leadership, benevolence, strength and abundance. This month for you is all about owning your confidence and soaking up the sunshine of your soul. A spark is being lit inside you right now- time to make things happen. Take center stage and know all eyes are on you and the Universe is offering endless applause and cheering on your every move. Do something this month that puts you out there- karaoke, make that big pitch, ask that person out, host a showing of the art you normally make in private. This is your one precious life to live and whatever you do, it should reflect your needs, desires, and passions above all else. Oh sweet lover of scales, we know you have been excited with something new but also a little overwhelmed. The motto this month is: baby steps. That project or change you are working on may have your head spinning but this month the universe is saying even the smallest move forward will be exponentially supported. Don’t be intimidated: just begin. Take one action step, even if it feels scrappy or super DIY. This stone is ready to lend you an extra scoop of courage and the vibes of an explorer this month. Some anxieties around what you want to do in life may be kicked up. Don’t run from them- explore them. With curiosity even. Remember: if you want to heal it, you gotta feel it. Feeling all the full range of emotions will help you enormously for this next chapter. Digging in the depths and getting a little dirty and dusty uncovering hard truths will pay off big time for next month. Play emotional Indiana Jones and excavate: journal, journal, journal keeping a log of anything that comes up. Is here to remind you to stay cool, calm and collected, our fiery little archers. Ch-ch-changes have been the name of the game this year but we all know change just creates more change so it can get daunting and feel never-ending at times. Don’t retreat- we know you have gone through a lot and it can leave you feel like you're running on fumes- but also don’t feel compelled to be rocketing forward. Yes, you’re on a soul journey and you’re doing all the right things in terms of diving in deep to your subconscious fears and desires. I promise this will all pay off in the long run as hard as it may feel at times. The thing is, you’ll transform regardless—you don’t need to put so much pressure on yourself to make it happen right this minute in just the right way. All that fire can end up being far more destructive than productive right now. Take some time to play in the water- pool, lake, ocean, a sprinkler, maybe even a slip and slide if you’re feeling particularly wet n’ wild. Time to fan that plumage and strut your stuff. Don’t compare yourself to others, our glorious sea-goat. There is a reason you are the only you out there. Don’t be afraid to shine a bit- we know it’s not always in your nature but don’t be afraid to invite in some of the rebel energy. In what ways in your life have you been waiting for approval before moving forward? Where do you defer to your friends, partner, or colleagues when you could actually speak up and take the lead on something yourself? Don’t worry about what others are doing or thinking AND definitely don’t worry what they are thinking about you- act in ways that reflect your priorities, your purpose and your power and all of those things will be magnified. Your stardust self-care homework is to break one rule (notice we said RULE not law lol!) and have fun while doing it. Named after the Greek moon goddess. Protects and purifies energy from heavier, denser energies and can also be used to clear spaces and other crystals. Mermaids, you have your full moon later this month so this means a time to really look at what is ready to be released, what is ready to be celebrated and what is ready to be manifested for the next year. What magical glowing presence is hovering out there that you could tap into, if you only put your mind to it? What is the next step that will bring you that much closer to the thing you seek? Your stone for August suggests that the answers to these questions will become much clearer over the coming month and you will begin to see with more clarity exactly what you need to do to make your dreams a reality. Help things along by creating a vision board or roadmap for yourself, your goal, or project. What would happen if you reached out and touched the moon?